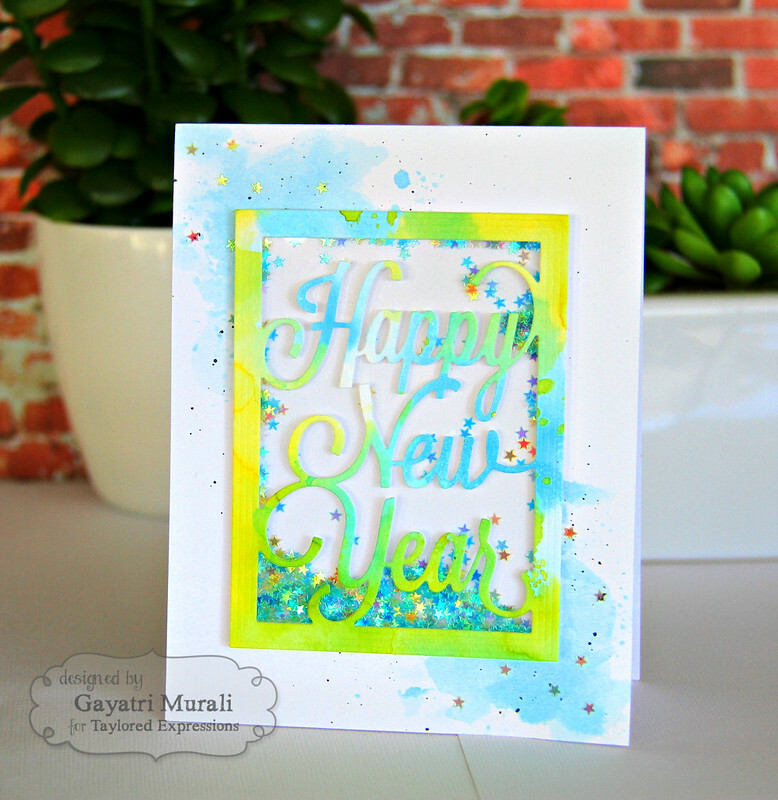 A quick post sharing a New Year Card I had made using Taylored Expressions Happy New Year frame die. This dies was released couple of months ago. I love the font of the sentiment on this die. So pretty! And the embossed details on the frame is a nice touch. I basically die some ink smooching technique on my card. On the card base, I smooshed Tumbled Glass distress ink with acetate sheet. Then did fine spatter of black ink too. To a watercolour paper, I smooshed Squeezed Lemon, Crushed Olive, Tumbled Glass and Salty Ocean distress inks. I smooshed each colour, dried using heat gun, then smooshed another colour and kept repeating the process until I was happy with the layers. Once dry, I die cut the Happy New Year frame using the Taylored Expressions die. I made a shaker box using the frame die and Martha Stewart tiny hearts glitter. I then adhered this shaker box to the card base. I also added some of the tiny hearts to the card base to bring everything together. Wishing all of you a very Happy, Healthy and Prosperous New Year 2016! A very bright and pretty card. Happy New Year to you! Such a beautiful card!! Love the vibrant colors! !